Roast chicken, root veggies, potatoes and chard - this is a hearty meal that will warm up any night. It's perfect for winter because it uses vegetables that store very well and provide you with lots of great nutrients. As a bonus, this takes about 10 minutes of active prep time, and one hour to cook. Chard is probably my favorite leafy green - it grows really well in the garden, lasting well into the fall (even through a hard frost). It also stores well in the fridge - just wrap the stems in a damp paper towel and store a bunch in a plastic bag in the crisper. It will stay crisp for at least a week, and is excellent steamed or in salads. The taste is similar to spinach, but a little more flavorful. Usually, I only see it in the organic section of the grocery store, but like I said - it's easy to grow in the garden, so you can enjoy it all summer and fall. Potatoes, carrots, and parsnips store very well in a cool, dark place - months, if you keep them well ventilated and cool, so buy or grow them and store them in a root cellar, crawl space, or shed (as long as it doesn't freeze). The recipe for the chicken is the easiest, tastiest one I know. It comes from Epicurious.com and easily feeds a family of 4. Buy whole chickens when they're on sale, preferably in packages of two or more. I got 2 at the wholesale for $14. Separate them out in ziploc bags when you gets home and freeze them. Rinse the chicken inside and out, and dry it off really well with some paper towels. You want to make sure it's as dry as possible, inside and out. Place it in a roasting pan and truss it up. Then take about 1 tablespoon of salt (or the salt shaker) and "rain" salt down on the bird so it's evenly coated on top. This will make a nice, crispy skin. Then throw that sucker in the oven at about 400° (the original recipe says 450°, but it always seems to get too dry when I cook it that way - could be my oven though). That's it. Don't baste it, don't look at it. While it's cooking away, cut up some parsnips, carrots and potatoes into large chunks. You want them to be about the same size so they all cook in the same amount of time. 2" cubes work. Once the chicken's been in the over for about 30 minutes, throw all the root veggies in the roasting pan with in and put it back in the oven for another 30 minutes. Finally, prepare some chard. Rinse each leaf and tear the green parts off the stem in chunks. Put about 1" of water in a large pot, and put the chard in a steamer basket over the water. If you don't have a steamer basket, just put the chard in 1" of water - you don't want to cover the leaves with water, just have enough in there to steam them. Leave this until the chicken is done. 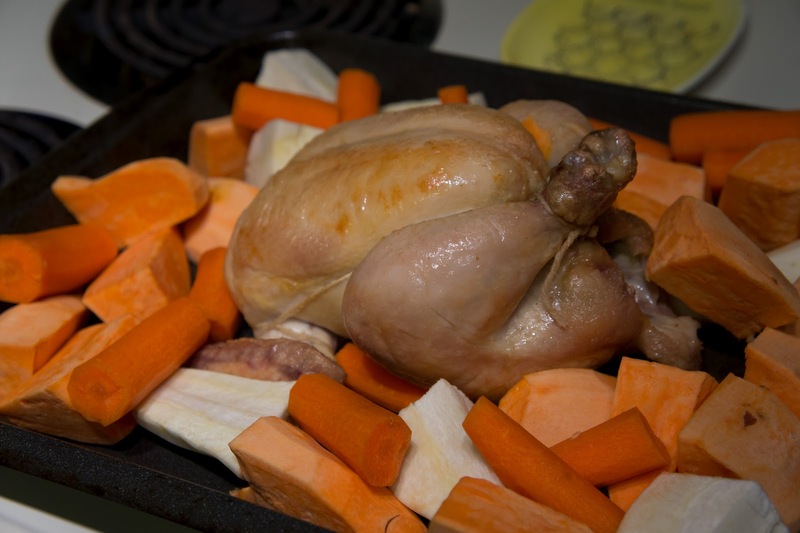 When the chicken is finished (check with a meat thermometer, or stick a fork in the side and make sure the juices run clear, not pink), take it out of the oven and remove the root veggies from the pan with a slotted spoon. Crush about 2 tsp dry thyme (not ground) into the juices, then baste the chicken with the juice and let it sit. Cook your chard over high heat for about 5 minutes until it all wilts. You can serve it with a bit of butter, or just plain. Now serve it all up!